Want bikes ready and waiting for you and your entire family? 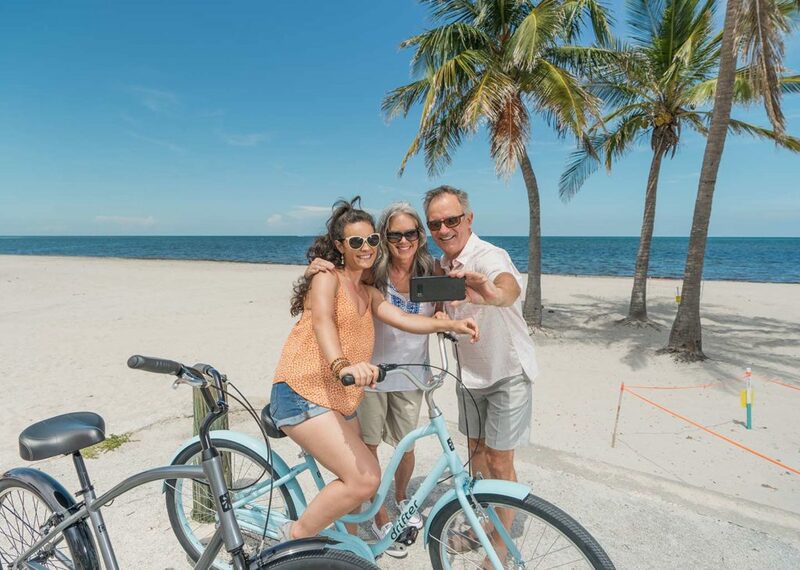 Book online for over a day rental and we’ll deliver them to Coquina Beach and pick them up. You won’t waste any of your time in the sun! Delivery is free on Siesta Key. For all other locations, we charge a delivery fee. See the FAQ page for delivery pricing and tips on frame type selection and sizing. If you book for a day or less and want them delivered, you will be charged the three-day rental rate. We have beach cruisers and these can go to the beach in Coquina Beach, but the geared bikes cannot. The cleaning fee for taking geared bikes on the beach is $50 per bike. Since 1995, Ride & Paddle has been Sarasota and Siesta Key’s largest fun rental business and now we are the most convenient. The same great equipment and service, upgraded so you spend more time outside and less time in the shop. We deliver and pickup to Coquina Beach. It is just that simple. Wonderful fun, even a windy kayaking day. No hassle desk service and friendly. Justin was just great... Helpful and friendly, he shared some insights and pointers to make it a great kayaking adventure at the launch. Had a great experience kayaking off crescent beach. Chris, is super friendly and helpful. We cannot wait to go back! 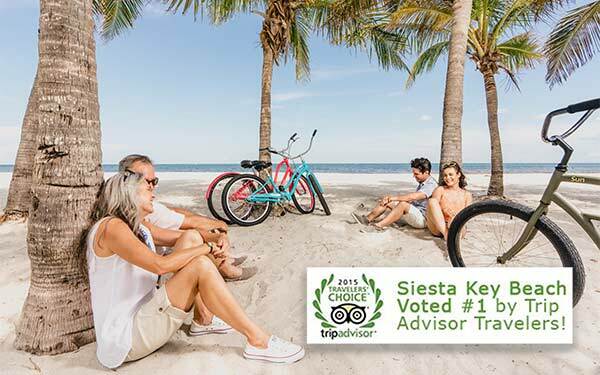 If you're heading to Siesta Key, make sure you rent a bike or kayak (or both!) from Siesta Sports. I booked both online before I arrived so I didn't have to worry about availability. The bike was delivered - for free - to my rental tiny house. I'm definitely returning to Siesta Key and renting from Siesta Sports again. Great customer service, friendly staff, and items in excellent working condition. You can tell the owner takes pride in this shop. Highly Recommended. Best place to rent beach gear in Siesta Key. Highly Recommended.Best place to rent beach gear in Siesta Key. Good service. On first bike the chain kept falling off, replaced the bike with no problem. Very helpful and respectful staff, we rented 3 scooters and it was great. Good scooters with crash bars for the riders safety. We had an a key break off in the ignition, but they were understanding and we were able to work it out. Once again Trish and her staff make our vacation more enjoyable! Rented a bike, blew a tire, they were out to fix it immediately! Always Friendly. The guys on the beach (Ian and new guy Ben) take care of everything not only for us but everyone on the beach at Midnight Cove! No better place to get your Bikes, Kayak, boards etc!! 5+ stars! This is a great place to rent gear for excursions in the siesta key area. We rented some snorkels for the day and the guy working at the store was nice enough to let us know some good spots to snorkel at. Unfortunately with the red tide in the area and high winds the snorkeling ended up sucking. Rented scooters here great experience. Staff is extremely patient and helpful. We had a great experience on our guided kayaking trip! Todd was very friendly and knowledgeable, and gave my son many tips for fishing. Loved seeing the mullets jumping out of the water and being able to go at a pace that worked for the whole family. We've been using siesta sport rentals for bike rentals and kayaking for more than 10 years. It is so nice to see the same friendly faces year after year.